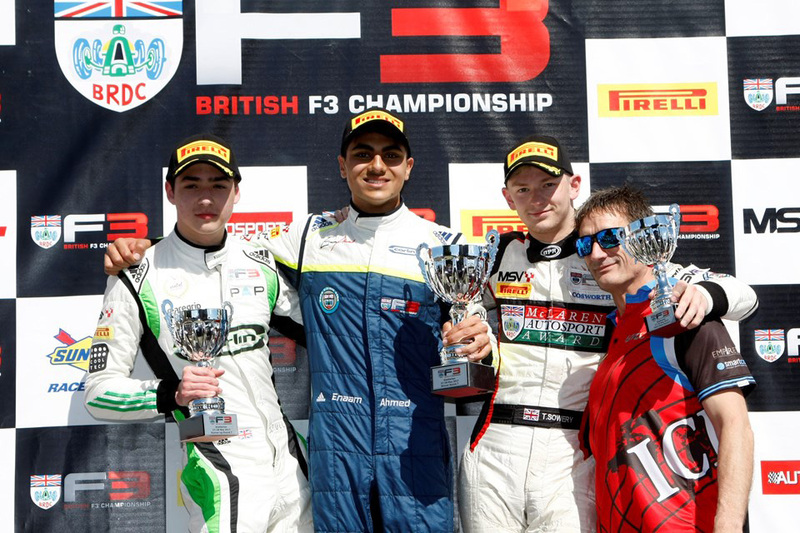 Snetterton Enaam Ahmed made up for losing a place at the start to overtake both Toby Sowery and James Pull, and in doing so, record his fifth BRDC British Formula 3 win of the season at Snetterton. Pull held on to second place from a charging Sowery, who returned to the podium after tough weekends at Oulton Park and Rockingham. We spoke to Toby Sowery on the podium to get his thoughts on the opening race of the meeting at Snetterton, won by Enaam Ahmed. Third place: Toby Sowery I was in a bit of a sandwich between James and Callan [Oâ€™Keefe], so it wasnâ€™t easy to race, but I still came back with a podium. Iâ€™ve not had the best of starts so far but itâ€™s good to be back. [The gap to second] was a bit like a yo-yo, James would pull out a little bit then weâ€™d catch or heâ€™d lose, so it was quite tough, especially following round here. The pace wasnâ€™t too bad, so itâ€™s a good improvement and race two should be good. Enaam Ahmed won his sixth race of the 2017 BRDC British F3 season in the final race of the weekend at Snetterton, converting pole position into the win. Toby Sowery successfully challenged front-row starter James Pull at the first corner, and although he chased after the leader, was unable to defeat Ahmed. Toby Sowery We were not quite close enough. It was a weekend we needed after the first few rounds, but hopefully we can get a win in the next races to come and hopefully more consistent podiums. I could see it was a bit of a Carlin sandwich, but itâ€™s tough to overtake round here, so I think it was fairly secure where we were.